"Saint of the Day Websites Directory"
Aurelius Augustinus was born in Tagaste (Tajelt), a town of Numidia, on the 13th of November 354 A.D. His father Patricius, was a burgess of his town, and was still a pagan at the time of his Augustine's birth. His mother Monica, was a devoted Christian woman of whose patient and answered prayerfulness for both husband and son personified the level of dedicated Love that affected both relationships by example deeply. It was she who in the formative years of Augustine guided his faith and Love for Jesus Christ. When at an early age Augustine fell ill, he asked to be baptised, but a quick recovery belayed the sacred rite till later in his yet formative life of a Saint. Contrary to his mother's unceasing prayers, Augustine followed the path of youthful ambitions and neglected many of his early guidance in his Christian faith. These were the years he would inherit his father's still pagan leanings and impulses of passion, which were quite common in the day, yet at odds with the principles of the Christian teachings his mother had worked so dilligently to instill within him. As the boy became a man, Augustine fathered a son whom he would name Adeodatus and to whom he himself was deeply dedicated too. By all reports, Augustine was a good father and a well focused student. Augustine's father, seeing his sons special talent for communication and writing, supported him in every way financing Augustine's studies in his native town of Tagaste, at Madaura and the home of many of the world's greatest writers and philosophers of the day, "Carthage". Augustine found a special afinity with many of the early Latin Poets of the day. This Love for Greek literature and especially the writings of the Philosopher Plato, would later be easily detected throughout most of Augustine's writings. During his studies in Carthage Augustine was introduced to the theatre, which were often well financed and intricate productions to which he found a particular enthusiasm in. During this period Augustine seems to have forgotten his early Christian guidance as even the Christian church itself often referred to such productions as "The Pagan Theatre". In the day anyone avoiding such a theater of Godless themes was considered to be a better Christian for it. Of course in later years Augustine himself would expose the folly of the so called Pagan Theatre and speak against it's function in existance. It was at the tender age of 19 years that Augustine read "Cicero's Hortensius", which awakened in his mind the spirit of speculation and contemplation. He focused passionately in the philosophical studies, and unable to find answers to his own burning questions, bounced from one train of philosophical thought to another in short order with a certain emptiness left in it's wake. In his study of "Manichaeism philosophy", Augustine embraced the principles of good and evil which for the first time seemed to satisfy many of the long awaited questions within his heart and mind. He now had at least some rationale for understanding the buring conflict of the higher and lower impulses which raged within him. Somehow this was the place where he would continue to solve the many mysteries which had perplexed him all of his life. So accordingly Augustine became a member of the Manichaeism Sect, and entered into it's class of auditors. His ambition was to be received by their leading membership and so gain their inner teachings and higher knowledge. It was in earnest philosophical discussion with Faustus, a distinguished Manichaean bishop that Augustine would become disenchanted with the entire Manichaeism system and so abandoned it a shortime thereafter. Augustine then ventured for a time to Rome in the pursuit of his professional interests and while there accepted an invitation to travel to Milan, where students were in search of a teacher of rhetoric. While in Milan Augustine recognized that even now in his 30th year of life he was still disatisfied, unfulfilled and the inner conflicts of his mind seemed even greater than ever. It was on such a day of inner turmoil that Augustine uttered the statement; "Tomorrow I shall find it. It will appear manifestly, and I shall grasp it..." (~Confess., vi. 18). But still tommorrow came and no revelation was forthcoming so Augustine began to sink into a deepening depression. 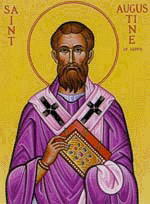 His destiny would however overcome his despondency when he heard about "Ambrose the bishop of Milan", and his noted reputation for eloquence and reason. Augustine was inspired to hear the famous Christian preacher, as he chronicals in his Confessio, v. 23; "To see whether his eloquence answered what was reported of it. I hung on his words attentively but of the matter I was but an unconcerned and contemptuous hearer..." He continued; "The bishop's eloquence was more full of knowledge, yet in manner less pleasurable and soothing, than that of Faustus..."
Augustine desired an opportunity to have conversation with the bishop but was unable to gain his audience at this time. Bishop Ambrose had no particular desire or need for philosophic discussions and although he made himself accessible to those who sought him, he avoided most conversation and kept strictly to the course of scriptural study. 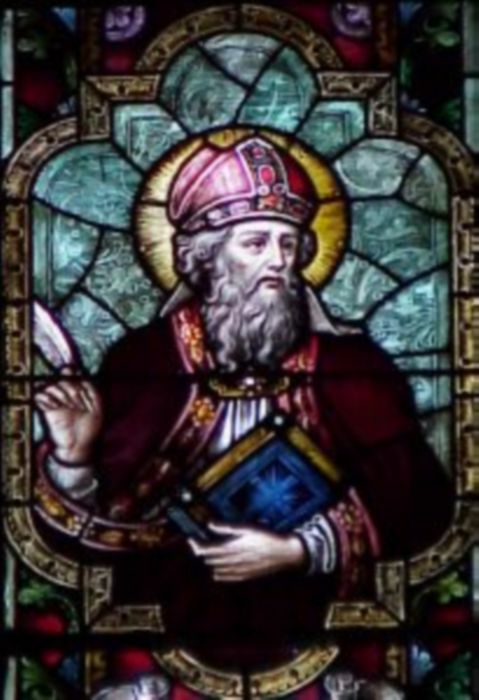 Augustine would often come to hear Bishop Ambrose preach, and gradually the words of the holy gospels were received into the heart of Augustine. He had a particular passion for the words of St. Paul and studied St. Paul's epistles with great fervor. It was at this time in Augustine's life journey that all the inner turmoil over his entire lifetime caused him to run out into his garden, fall down under a fig tree and burst into an incontrollable torrent of tears. As he poured out his heart to God, he appears to have heard a voice calling him to consult the divine oracle, and; "Take up and read, take up and read..." Augustine rose up still weeping as in silence he read the following passage; "Not in rioting and drunkenness, not in chambering and wantonness, not in strife and envying. But put ye on the Lord Jesus Christ, and make not provision for the flesh to fulfill the lusts thereof..." (Rom. viii. 13, 14). Augustine adds, "I had neither desire nor need to read farther. As I finished the sentence, as though the light of peace had been poured into my heart, all the shadows of doubt dispersed. Thus hast Thou converted me to Thee, so as no longer to seek either for wife or other hope of the world, standing fast in that rule of faith in which Thou so many years before hadst revealed me to my mother..." (Confess., viii. 30). 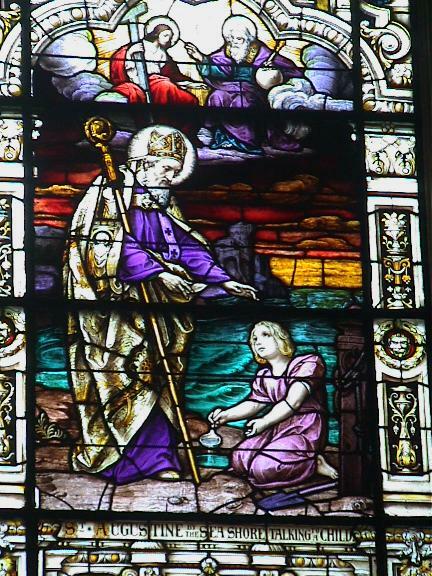 After his conversion in the garden, which occurred during the summer of 386 A.D., Augustine gave up his profession as a teacher, and retired to a friend's house in the country, in order to prepare himself for holy baptism. His religious opinions and knowledge were still developing, but as he mentions, this time he was able to brake himself off the habit of profane swearing, and unconscious behaviors in order to prepare himself in discipline and character to conduct the sacred rites. He then received Holy Baptism during the Easter season during his 33rd year of life. His son Adeodatus and his friend Alypius joined Augustine and were admitted to the Christian church. Monica, his mother, had rejoined Augustine, at long last could rejoice in the fulfilment of her fervent prayers. Dying before his return to his native country, Augustine's mother's last hours were made peaceful by her son's Christian compassion and Love for her. She implored Augustine to lay her body anywhere, but wherever he might be, to remember her "At the altar of the Lord..." a devout duty which he invited others to share with him, so that her last request may, "Through the prayers of many, receive a more abundant fulfilment..."
Augustine returned to Rome before returning to his own native city, where he took up his retirement, forming, with some friends and followers who joined him, in a modest yet devotional religious community, which Augustine himself guided. As in the early church, Augustine's religious community fostered Fasting, Prayer, Scripture readings and Almsgiving, along with the pursuit of their regular daily occupations. Although their devotional life was not considered monastic their practice of seclusion was undoubtedly the basis for the monastic system which Augustine later outlined and which derived from him its name. 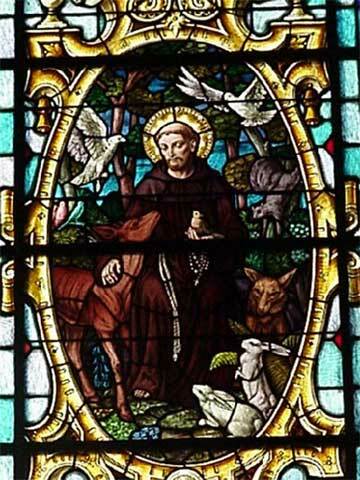 After three years spent in devotional retirement, Augustine took a journey to Hippo, to visit a Christian friend, who had expressed the desire to converse with Augustine as to his philosophy for "Quitting the world and devoting himself to a religious life..." Although Augustine was reluctaut to make this journey, since a Christian community with a bishop were already in place there, Augustine made the trip and while at a Christian community meeting was called uopn to serve in the capacity of a Presbyter, a kind of Archbishop of the day. He was ordained into the position, and a few years later was made the sole Bishop of the community. Augustine's life became well filled with his ecclesiastic calling, and it is primarily during this period that his numerous writings were generated. He had by this point become a distinguished author and had written several philosophical treatises combating the scepticism of the New Academy (Contra Academicos libri tres, 386 A.D.) which he describes as the "Blessed Life" (De vita beata, 386 A.D.) and of the "Immortality of the Soul" (De Immortalitate Animae, 386 A.D.) Augustine is noted for defending the church against the "Manichaeans" whose doctrines he had formerly professed so emphatically. He writes in his (Retract., i. 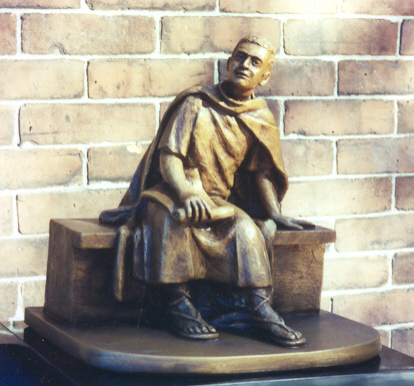 7), "When I was at Rome, after my baptism, and could not hear in silence the vaunting of the Manichaeans over true Christians, to whom they are not to be compared, I wrote two books, one on The Morals of the Catholic Church, and the other on The Morals of the Manichaeans..."
Augustine published Christian tracts or pamphlets, written in the year 388 A.D., about two years after his conversion. Later, in 395 A.D., he re-entered his controversy with the Manichaeans, and his old associate Faustus. 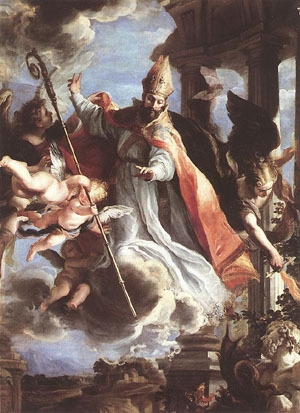 Augustine's reply was provoked by an attack made by Faustus on the Catholic faith, which the Christian community depended on Augustine to address. Augustine enthusiastically responded by publishing the opinions of Faustus, as if stated by himself in the second person, side by side with his own Christian response. It was afterall only normal that after all the Manichaean's had so made his own thoughts captive that Augustine would unleash his own sublime abilities as a Christian and Theologian to now rain down upon the Manichaean's invitation to an intellectual and spiritual war. Augustine's was fully capable now of drawing from his own experience with the Manichaean's to give force and deeper meaning to his arguments for the unity of all Creation and of the Spiritual life, and to strengthen the mind and will of the Christian church in its struggle with the dualistic teachings and constant critisisms which the Manichaean's had hurled against Christianity. Even as Augustine brought down the intellects of the Manichaean's, his powerful intellect now drew a bead through his writings on the Donatists who questioned the constitution of the Christian church and the idea of a Catholic order. 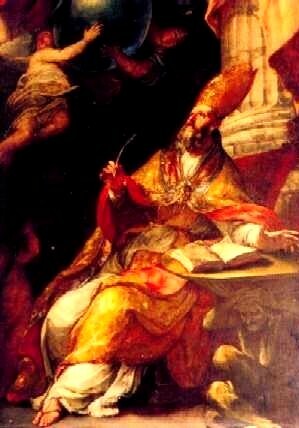 The Donatist philosophy rose up from the Diocletian persecutions which in conjunction with the Church of Carthage, had a fanatical zeal on to distinguish themselves by resisting the imperial mandates of martyrdom, filled with a deep resentment at the appointment of Augustine as a bishop. Based on this hostility, the Donatists set up a bishop of their own, by the name of Majorinus, who was succeeded in 315 A.D. by Donatus. The group made great pretensions to their purity and discipline, and rapidly rose in popularity in spite of a decision made against their movement by both the bishop of Rome and by Emperor Constantine. Augustine was strongly inspired by the recklessness of their beliefs to launch a series of his writings against them. Amongst these are the "Seven Books on Baptism", and in his three books, to Bishop Petilian of Cirta, who was himself a theologian amongst the Donatist movement. Solitary Monasticism had it's early inception in the Egyptian deserts and the public life of "St Anthony by Athanasius" had by then decreased the fervour for a religious and solitary life. During this period Augustine may not have been attributed as the founder of the Monastic movement but rather to the association of Monks in communities under the rule of order which Augustine attributed to the special inspiration received from Bishop Ambrose. Augustine's writings soon spread throughout the land and although he received numerous invitations to to continue a more active ecclesiastical life, he withdrew from public life in his latter years and made way for the destiny of his prolific writings to continue his legacy. Let Mary now make a loud noise upon the organ, and between its quick notes let the rattling of the Mother's timbrel be heard. Let the gladsome choirs sing with her, and their sweet hymns mingle with the changing music. Hearken to what a song her timbrel will make accompaniment. She saith; My soul doth magnify the Lord, and my spirit hath rejoiced in God my Saviour. For he hath regarded the lowliness of his handmaiden, for, behold, from henceforth all generations shall call me blessed. For he that is Mighty hath magnified me. The new miracle of Mary's delivery hath effaced the curse of the frail backslider, and the singing of Mary hath silenced the wailing of Eve. Just see if it isn't as I say. While the Lord was passing by, performing divine miracles, with the crowds following him, a woman said; "Fortunate is the womb that bore you..." And how did the Lord answer, to show that good fortune is not really to be sought in mere family ties..? Rather blessed are those who hear the word of God and keep it... (Lk 11:27-28). 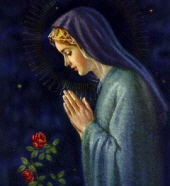 So that is why Mary, too, is blessed, because she heard the word of God and kept it. She kept truth safe in her mind even better than she kept flesh safe in her womb. Christ is truth, Christ is flesh. Christ as truth was in Mary's mind, Christ as flesh in Mary's womb. That which is in the mind is greater than what is carried in the womb. "A thing is not necessarily true because badly uttered, nor false because spoken magnificently..."
"Beauty is indeed a good gift of God; but that the good may not think it a great good, God dispenses it even to the wicked..."
"By faithfulness we are collected and wound up into unity within ourselves, whereas we had been scattered abroad in multiplicity..."
"Charity is no substitute for justice withheld..."
"Complete abstinence is easier than perfect moderation..."
"Do you wish to be great..? Then begin by being. Do you desire to construct a vast and lofty fabric..? Think first about the foundations of humility. The higher your structure is to be, the deeper must be its foundation..."
"Do you wish to rise..? Begin by descending. You plan a tower that will pierce the clouds..? Lay first the foundation of humility..."
"Don't you believe that there is in man a deep so profound as to be hidden even to him in whom it is..?" 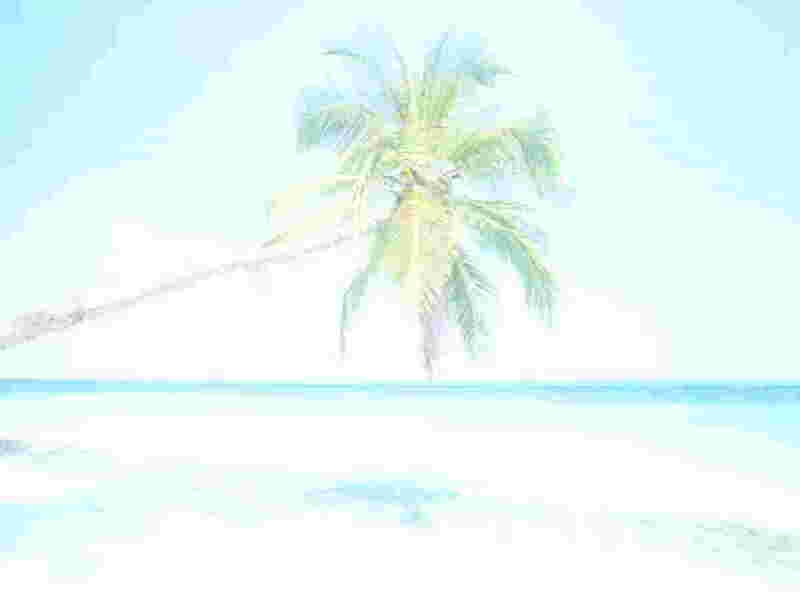 "Faith is to believe what you do not see; the reward of this faith is to see what you believe..."
"Find out how much God has given you and from it take what you need. The remainder is needed by others..."
"Forgiveness is the remission of sins. For it is by this that what has been lost, and was found, is saved from being lost again..."
"God had one son on earth without sin, but never one without suffering..."
"God judged it better to bring good out of evil than to suffer no evil to exist..."
"God loves each of us as if there were only one of us..."
"Grant what thou commandest and then command what thou wilt..."
"He that is jealous is not in love..."
"He that is kind is free, though he is a slave. He that is evil is a slave, though he be a king..."
"He who created us without our help will not save us without our consent..."
"Humility is the foundation of all the other virtues hence, in the soul in which this virtue does not exist there cannot be any other virtue except in mere appearance..."
"I found thee not, O Lord, without, because I erred in seeking thee without that wert within..."
"I have read in Plato and Cicero sayings that are wise and very beautiful, but I have never read in either of them; Come unto me all ye that labor and are heavy laden..."
"If two friends ask you to judge a dispute, don't accept, because you will lose one friend. On the other hand, if two strangers come with the same request, accept because you will gain one friend..."
"If we did not have rational souls, we would not be able to believe..."
"If we live good lives, the times are also good. As we are, such are the times..."
"If you believe what you like in the gospels, and reject what you don't like, it is not the gospel you believe, but yourself..."
"In the absence of justice, what is sovereignty but organized robbery..?" "Indeed, man wishes to be happy even when he so lives as to make happiness impossible..."
"It is not the punishment but the cause that makes the martyr..."
"It was pride that changed angels into devils. It is humility that makes men as angels..."
"Love is the beauty of the soul..."
"Love, and do what you like..."
History of the St. Augustine Lighthouse, Florida, USA St. Augustine has always been a challenge for mariners. The conditions of the weather, water, and land are a hazard for citizens and marauders alike. After Pedro Menendez founded St. Augustine, Florida in 1565, he decided to build a wooden tower on the north end of Anastasia Island. The tower was to be manned by a single Spanish soldier to help identify incoming ships. 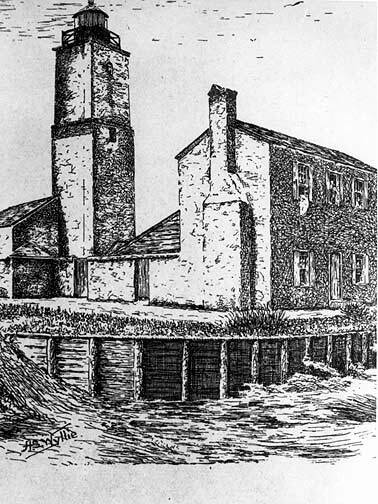 Primarily a defensive measure for the settlement, the tower also served as a landmark for sailors attempting to locate the town from sea, amid the wilderness. The watchtower was meant to aid ships to the location of the port but it also showed the way for Sir Frances Drake in May of 1586. Drake, an English privateer, pillaged and burned the city and the tower. 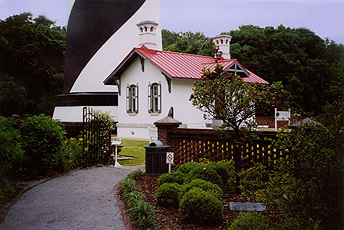 The St. Augustine Lighthouse contains an estimated 1.2 million bricks. 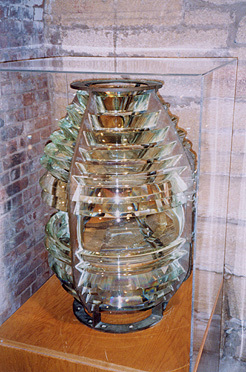 The lens in the lighthouse is original and dates back to 1874. It stands 9.5 feet tall and contains 370 handcut prisms, including three bullseyes, set in brass frames. 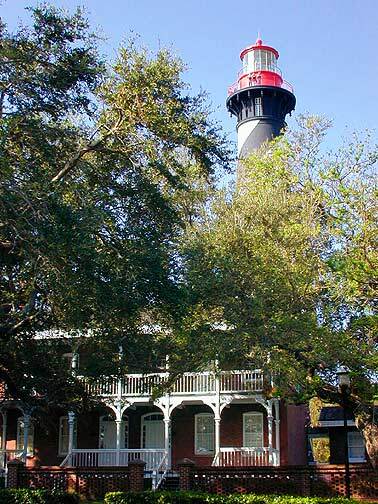 Before electricity, the St. Augustine Lighthouse keepers had to wind the clockworks system that kept the lens turning. Weights were suspended from the rotating mechanism at the top, through the center of the tower. They hung just above the weight well in the bottom of the tower. In the lens room the keepers cranked this weight up to the first landing. Once wound, it would run close to 3 hours long. This equipment is no longer operating in the tower. Today a 90-second lens rotation, with the three evenly spaced bullseyes, results in a night signature of one fixed light, white flash every 30 seconds. 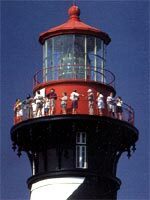 The St. Augustine Lighthouse beam can be seen a maximum of about 20 nautical miles, or 21.5 statute miles out to sea (1 nautical mile = 1.15 statute miles). In 1911 the US Lighthouse Service reported the distance as 18.75 miles but without providing all the specifications. Of course, over land the beam does not reach as far due to intermittant interferences. 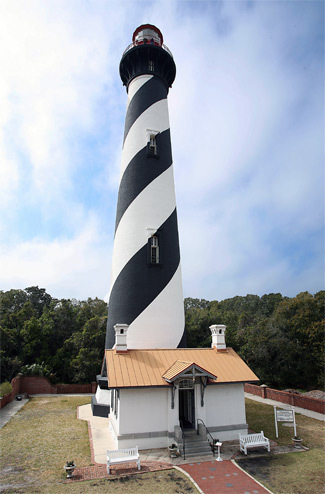 The St. Augustine Lighthouse, with its distinctive black and white spiral and red top is 165 feet tall. There are 219 steps to the observation deck, including the granite steps leading up to the metal stairs. 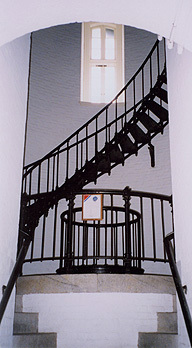 Ten additional iron steps, accessible only to lens personnel, go up to the lantern inside the lens room. The observation deck is about the height of a fourteen-story building. Life of St. Augustine "Biography of St. Augustine" Quotes of St Augustine "Saint Augustine on the Virgin Mary"